The Urban Politico: Snyder v. Phelps: How Far Should We Stretch the First Amendment? Snyder v. Phelps: How Far Should We Stretch the First Amendment? Growing up in Kansas, it was hard not to know Fred Phelps and his band of Church rebels. To say that they were ubiquitous would be the understatement of the century. If the KU Jayhawks had a basketball game - they were there protesting. K-State football game - they were there protesting. A little girl opens up a lemonade stand on the corner - yup...they'd protest that too. No public event was sacred to the Phelps Church (we'll come back to this statement shortly). For those of you who may not be familiar with the Phelpses, they run a Church in Topeka, Kansas where the primary sermon on any given Sunday is the part of the Bible that says, quote, "God Hates Fags," unquote. I'm sure you remember that verse from Sunday School in the book of Hateronomy, right? No? Well according to Fred Phelps it's in there somewhere and he has decided to make it his life's work to inform the entire world about it whether you asked him or not. Which brings us back to sacred events or the lack thereof. In 2006, Albert Snyder, father of the late Marine Lance Cpl. Matthew Snyder who was killed in Iraq in the line of duty, held a funeral service to lay his son to rest in Westminster, Maryland. 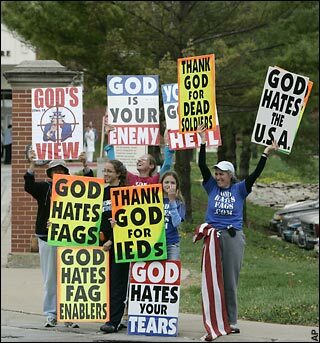 The Phelps congregation, which as you will recall is from Kansas, made it their business to travel all the way over to Maryland (over 1,000 miles away) to protest the funeral with the message that God is punishing America for being tolerant of homosexuality. Snyder successfully sued the Phelps congregation for $5 Million dollars in Maryland state court for intentional infliction of emotional distress, but when the case was appealed by the Phelpses a federal court threw out the case on First Amendment Freedom of Speech grounds. The case was finally appealed up to the United States Supreme Court who heard oral argument yesterday (Oct 6, 2010). The question before the Court was how far should we stretch the free speech protections of the First Amendment? You don't really have to go to law school to know that in America we have this great freedom called the Freedom of Speech. Whether we realize that this freedom is contained in the First Amendment to the U.S. Constitution or not, we all know that it exists. What many of us DON'T know, however, is that, contrary to popular belief, the First Amendment Freedom of Speech is not a license to say whatever the hell we want whenever the hell we feel like it. In other words, Freedom of Speech is not absolute. It does have limitations. For example, if you say something false that is damaging to somebody else's character, they have the right to sue you for "slander" (if its in print it's called "libel"). Pleading to the judge about your free speech rights would not get you off the hook for a defamation claim. Another example of the limitations on free speech would be shouting words that you know are likely to incite a riot. The First Amendment doesn't protect your freedom of speech there either. See Brandenburg v. Ohio, 395 U.S. 444 (1969). And yet a third example where freedom of speech is limited would be words that injure others in some way, such as threats to do harm to or kill people. You want to threaten somebody? Go right ahead, but just know that the First Amendment will not provide a get out of jail free card when the cops slap the cuffs on you. Though the case is about funeral protests, [Justice] Breyer said the court's ruling will have an effect on the Internet, because it tests whether vicious personal attacks — often made by bloggers — can lead to lawsuits. Forty-eight states, 42 U.S. senators and veterans groups have sided with Snyder, asking the court to shield funerals from the Phelpses' "psychological terrorism." The Supreme Court is expected to make their ruling on this case sometime in Spring 2011. 1. So which way should the Supreme Court rule on this case and why? 2. Is there any way for the Court to rule against the Phelpses but still uphold the First Amendment right to Free Speech? 3. What happens if the Phelpses win? 4. What happens if Snyder wins?